Two tortillas made from freshly ground organic corn, filled with a blend of cheeses, accented by olives and peppers, and covered with a traditional Mexican sauce. This product traveled 1432 km to reach our warehouse. 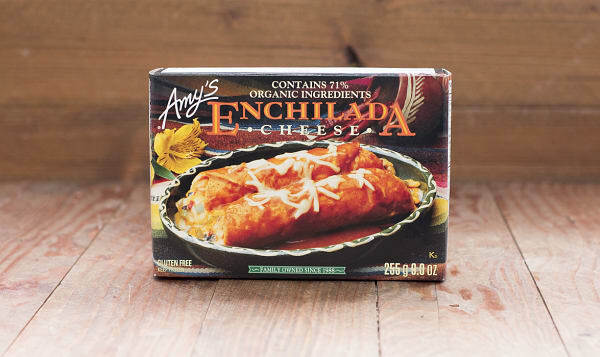 Amy's Kitchen began when two loving parents realized that there were very few healthy, organic, vegetarian convenience foods offered in the marketplace. After the birth of their daughter Amy in 1987, the company Amy's Kitchen began. Their mission is to provide delicious, organic, vegetarian prepared meals for people who appreciate good food, but are often too busy to cook. It remains a family business today, producing and selling more than 50,000,000 items a year.